The story of all or almost all of our patients is practically the same: people who have suffered and struggled against being overweight or obese for years without success. Many of them since childhood or adolescence and have failed to get enough success with other measures such as acupuncture, homeopathy, diets of all kinds (high protein, high fat, low-fat, diet of the moon, etc), nutritionist, hypnosis, psychologist, etc. Unfortunately, when a person reaches a certain point in relation to its weight that is too high for their height and body frame, there are few options to solve the situation, not to say that only one, that is fully effective and definitive and that is obesity surgery (mainly the gastric sleeve. It is important to stop here and take into consideration that although obesity surgery is an excellent tool for weight loss, the patient must be willing to make permanent changes in their diet and lifestyle. Since there is sometimes the misconception that the surgery will take care of everything without the slightest effort by the patient. We often tell our patients, as we stipulate here, that it is a great tool and not a "magic" procedure that will take care of everything. The patient that chooses to undergo weight loss surgery must do its part to achieve the best possible results from it. Despite of what we mentioned in the previous point, we know how difficult it is to commit to a definitive change when there is no adequate stimulus or in other words when discouragement gets in the way. What do we mean by this? Well, it's a fact that anyone who decides to lose weight can achieve it and sometimes in considerable percentages, which will help boost your mood and desire to follow the same path to weight loss and a healthier life. But there always comes a point where the patient gets "tired" and begins to sag a bit and to be more flexible (or less observant) of the quality and quantity of food they eat. It is that point when all the effort done for weeks or even months collapses and weight gain begins, and usually with a “vengeance”. When a patient undergoes weight loss surgery, he/she achieves to eat food in limited quantities but this limitation will not be marked only by willpower but by the restriction and decreased appetite that these surgeries produce. Allowing weight loss to be constant and sustained for months/years, which serves as a great stimulus for that patient to change its habits permanently and thus able to maintain the desired weight that otherwise would not have been possible to reach or keep. Many people completely reject the option of bariatric surgery because of fear of complications or even death. And while it would be risky and irresponsible on our part to say that it is impossible for something to happen, so it is with any other activity in which we put through in our daily lives, for example, driving a car, getting on a plane or even when doing activities as "harmless" as running, biking or skiing. Nobody will ever ensure that some of these activities do not pose a risk, but how likely is that the plane will crash? The possibility is very low but it exists. The same applies to any surgical procedure, the risk exists, however, in expert hands and with adequate preoperative and postoperative assessment these risks are minimized. The gastric sleeve surgery has a risk of death of 0.25% and risk of complications of less than 3%. So as you can see, the chances of success of bariatric surgery are very high which makes it a "risk" well worth considering the benefits and is an opportunity that really should be given to or considered by anyone with obesity problems. It is also very important to note and being objective, it is much riskier to be obese and even more when this disease is accompanied by complications (comorbidities) such as diabetes, high blood pressure, sleep apnea, etc. than having a surgery. Unlike what many people might think, these procedures were not born from the search for a more attractive physique but from the need to offer people with moderate or severe obesity a real solution to their health problem. Weight loss surgery is far from the concept of being aesthetic as its principles are based on gradually reducing the accumulation of fatty tissue in the body (under the skin and organs) by modifying the ability of the person to absorb food, restrict the amount they can eat or a combination of both. The end result is the resolution of the problem from its "root" since fat is what the body uses as an energy source when food intake in quantity and quality are modified. Subsequently leading to the decline of these reserves of body fat. Cosmetic surgery instead, attacks the problem only superficially, literally speaking. Liposuction, tummy tuck, and other procedures involving the removal of body fat under the skin to give a better contour and shape to the body is an “easy fix” but not long lasting solution. There are proven studies in which the results are analyzed in relation to the percentage of body fat lost in patients operated from liposuction and showed that after several months (between 12 and 18 months) all the fat that was removed from the body had come back since the patient's eating habits were not modified. This is definitely the main reason why obesity surgery is an excellent and successful branch of general surgery, as it has been scientifically proven for many years now, that bariatric surgery such as gastric sleeve, gastric bypass and even in select cases the gastric band resolve or greatly improve patient’s health. The health benefits are numerous, the best known and proven is the cure/remission of chronic degenerative diseases such as type 2 diabetes and high blood pressure. It is important to clarify that not all patients show a definitive cure for these or other diseases, but it is a fact that although it might not be cured permanently they at least have a significant improvement, leading patients to a better control of these diseases with a smaller drug amount and concentration. In all bariatric procedures, modification of lifestyle, behavior and eating habits play a critical role in the long-term success in weight control and disease. 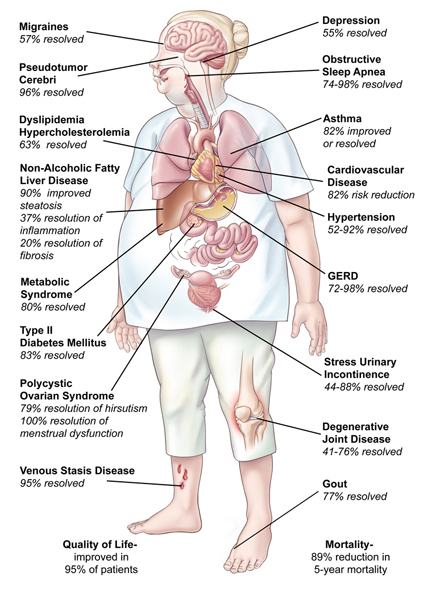 We provide here a list of the multiple diseases that show remission or are prevented with weight loss surgery. An excellent and very representative summary of weight loss surgery benefits is that it increases life expectancy of a previously obese patient up to 10 years, reducing mortality in 90% and increased quality of life in 95% of the cases.